Azo-Benzene pi->pi* transition, functional group effect are examined by molecular orbital theory. 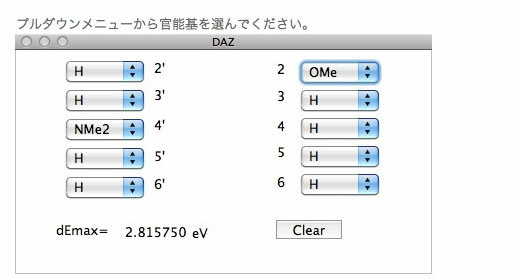 But MO calculation need so much time and it is hard to evaluate hydrogen bonding effect(2,2' position). Please copy(select and Ctr C or command C) below structure and calculate CNDO/2 !! Seeing is believing. you can see Azo-Benzene's molecular orbital on your browser. I examined dE by using neural networks. This method shows much better result compared to PPP method. And much much faster than MO method. Please pull down and select functional group. If you select functional group at certaine position, neural network calculate dEmax instantly. COmpare with this result to color bar, you can easily find out the color of this azo-benzene. You can easily find out this method is very fast, and the pi->pi* transition result are very accurate as showing below chart. Calculation result of PPP method. Correlation factor is 0.97873, not so good. It is said, worse result come from Hydrogen bonding (2,2' position). The indivisual calculation is very fast. But doing it by hand is boring task. Let's make search by computer. Program search 4,4',2,3,2',3' position. Scrollbar is something wrong, please use arrow key to scroll. This level means "how many substitution" computer search. The priority is 4,4',2,3,2',3' position. So if you enter level=3, program search 4, 4' and 2 position. 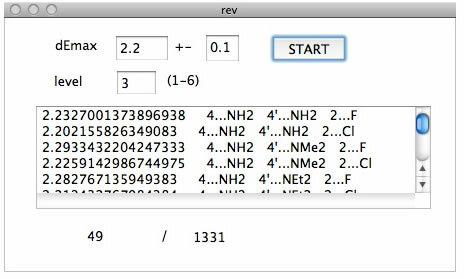 With this case, program calculate 1331 compounds and dEmax(=2.1-2.3) meet 49 compounds.